Happy Friday! This week's Bloggers Challenge is a color challenge: Orange, Blue, Moss (netruals as needed, in place of Moss I used Olive). I know I had something in mind months ago when I posted the monthy challenges on the BC Yahoo Group, but when I sat down to create my card, I drew a blank. So, I went for an old standby and used the colors for a masculine Warhol card. Looking for more inspiration using this weeks color challenge, click on the Bloggers Challenge Logo on my sidebar to see what the other designers created this week. This card rocks!! I agree with Suzanne...masculine cards are definitely not my forte'! Love the Warhol look. Great card! I love the bold colors for this challenge that you used! You are fantastic at manly cards and this one is fabulous! You did a great job with this different color combo you came up with!! Love that image too!! Great man card!! Luv the colors put together in the warhol style! Cool - love how you did this! Too funny! I hestitated a little bit, too, with the colors. But...I really like them! Perfect for the Warhol technique...great job! All I could think of was the Nina, Pinta and SantaMaria! :) I love the warhol style cards. Beautiful Job Lisa! Lisa, you are the queen of the Warhol cards!!! Fabulous job....as always!! Love the use of the Warhol technique to show off the colors. The stamp you used was so cool. Great masculine card. Wonderful card. The ships look so vibrant with the colors you used. Perfect masculine card. 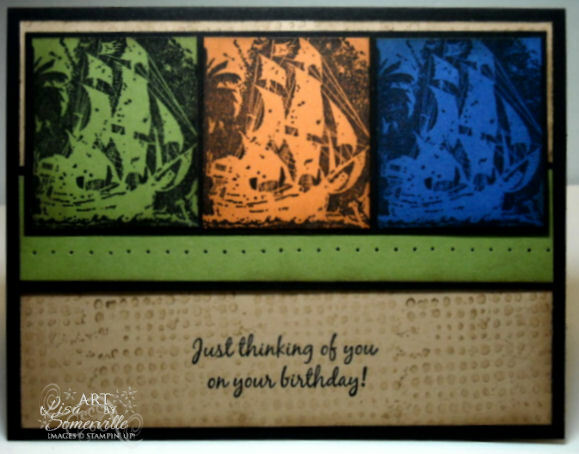 Great card, that ship is perfect with the Warhol look! 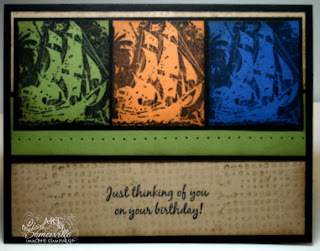 You can never go wrong with Warhole...love your card and the stamp is perfect for masculine. Thanks for the challenge Lisa. Perfect technique for these colors Lisa! Love all the color in this card! I have never done this technique..but have seen some beautiful cards using the technique! You have inspired me to try it...I am adding it to my list to try this week!! I actually gasped out loud when I saw your card! Just stunning! Beautiful! I didn't think about the Warhol technique... I love that effect. Great manly card. Your image is perfect for Warhol! Lisa-this is a great card--love the paper piercing, love the colors of the blocks--esp.the blue one. You did a good job on a "warhol" design. These colors worked perfectly with the Warhol technique! Love it!